This was not a Challenge for the ultra-lightweight brigade: May in Scotland is now very unpredictable and you do need really good gear to help you through as well as a strong attitude. I’ve temped to reply, “rubbish”. I spent time with most of the lightweight Challengers this year. All of those I met had a great time, finished and were having a great time in Montrose when I last saw them. Maybe there was someone who had a bad experience but in general the lighter-weight approach seemed to prove itself again. The TGO Challenge does offer an interesting insight into the kind of gear that mainstream backpackers are using in the UK. After each Challenge so far I’ve written a piece on this and this quote prompted me to do the same. There’s no doubt that Colin Ibbotson has caught the attention of many and the imagination of more than a few. 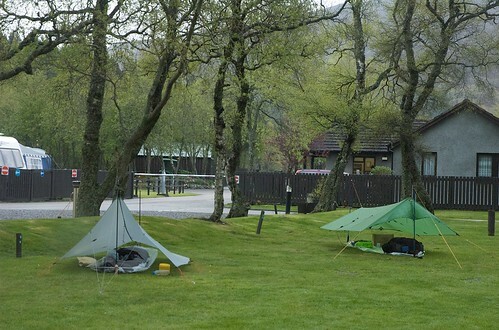 Colin is now well known by Challengers who gather round his tarp and campsites in wonderment! There’s also some fun around this. Gordon Green and his rather irreverential mates had a great gag going through the latter stages of the challenge, producing a tiny stuff sack and claiming they’d got Colin beat! Colin takes this all in good spirits! Few of us are going to read Colin’s stuff and head out to the Scottish Highlands in a tarp, although a few first timers did just that this year. But there’s no doubt that folks like Colin make us think and reassess our gear. I saw some terrible blisters on this year’s Challenge, and heard about many more. I’ve no doubt that many of problems would have been avoided or far less painful if people had made sensible decisions about kit. However, it is not my job to preach. The Challenge is a personal event and part of that Challenge is choosing your gear. However, these are some of my observations from this year. I missed that Challenge last year. During that time there has been a definite move towards lighter shelters. On my first Challenge the Hilleberg Akto was king. On my second I began to see a few more Laser Competition tents, which are half a kilogram lighter. This year I reckon the Laser was pushing ahead. It now seems to be the tent of choice for new, solo, Challengers. And when the time comes to replace the Akto it’s clear that the Competition is the main choice. The Akto may be more reliable up high in strong winds but on the other hand Competition is cheaper than the Akto. John Manning started out with a Laser Photon which is even lighter than the Competition. He switched for last week to his Henry Shires tarp tent, a single skin tent. Alan Slowman was using his Stephenson Warmlite tent which is also single skin but a monster size for one and still lighter than the Akto. Also using a Henry Shire tent was Chris Townsend who was using the Scarp, a similar tent to the Akto but one which is more roomy and lighter. 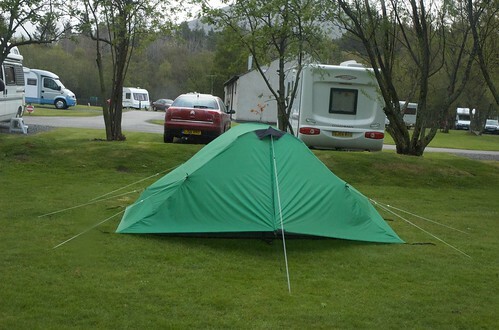 Phil Turner was using a Golite Hex tarp tent. US backpacker couples Rob and Lisa Hausam and Nigel Ellis and Lyn Paquette both opted for the same arrangement, a Lunar Duo tent from Six Moon Designs. At just over 1 kilogram the Lunar Duo is half of the weight of a Hilleberg Nallo of a Terra Nova Super Solar 2.2. The Lunar Duo is a very roomy tent and apparently coped very well with wind. As Stirling begins to climb against the Dollar I wonder if we’ll see more of these in future years. And there a few other tarps. Alistair Hunt was using a large two person tarp. He’d had little time to practice configuring the tent but found that he had so much room to play with that it was easy to keep dry without any difficulty. Jon Hancock was using a Golite Tarp. I liked Jon’s attitude. He was using lightweight gear but gear that didn’t cost a fortune. Much of his gear had been collected over the years but selected for lightness, comfort and effectiveness. And, of course, we had Weird Darren who used his tarp occasionally! To be honest, I can only see this trend continuing. I think we will see more tarp tents and yet more Competitions on future Challenges. There has also been a move in this department as well. The Golite Pinnacle is now quite a popular pack on the Challenge. Although this is a ‘backless’ tent it is cavernous, indeed, I sometimes think it is too big. With that much space you’re going to be tempted to fill it up. I reckon the Golite Jam is capable of a Challenge crossing and I noticed more that one or two of these as well. Kate and I both use ULA packs and as usual there were a sprinkling of these around the trails. But I noticed this year that those I saw were the Circuit and the Ohm, lighter than the Catalyst than I used on my first Challenge. To this we’ve also got to add a few Gossamer Gear Mariposa packs and a few OMM packs. I think there’s change in the mainstream department as well with Osprey’s lighter packs being particularly popular, especially the Exos range which are reputed to be more comfortable than the Atmos range. These packs still seem to me to be heavier than they need to be but I guess that they are more than half the weight of what you would have used ten years ago. I didn’t really get a chance to go into this is any depth, but from chats I reckon there are more and more lightweight meths stoves being used these days. Back to those blisters. This was a very wet Challenge. The people I met all got their blisters the same way; water got into their boots and they became impossible to dry out. However, I think more and more people are using lighter, boots that are more breathable â€” especially those without Gore Tex linings. Of course, I use Inov-8 shoes. Quite a number of the first timers were using them this year, indeed, for a few days we walked in groups where everyone was wearing the Inov-8s. We splashed through streams and bogs happy in the knowledge that the shoes would dry out quickly. Inov-8’s are not everyone’s cup of tea. But other brands of trail shoes were well represented on the Challenge. It would seem that more and more people are trying out lighter footwear and that once they do the boots stay in that cupboard under the stairs. I’ve no doubt that there is a clear trend towards lighter gear. I do believe that this makes hiking more pleasant and leads to fewer foot problems and injuries. I’m sorry that the TGO organisers feel the need to have a pop at lightweight hikers. They did this after the last Challenge I was on. It seems unnecessarily provocative to me. Light hikers crossed Scotland as well as the others, high or low. They all professed themselves to be happy with their kit and most chatted openly about how they could go even lighter. If you are worried about the comments quoted above and are thinking twice, remember. These comments are nearly always made by people who have never, ever, walked for any length of time with modern, lightweight, gear! In the light of your comments regarding me and my “irreverential mates” I have now penned a piece on the TGO message board. I’ll have a look at some point Gordon. Just writing about the great curry event – nice night out. Actually Andy, it’s a sealed, double skin tent between the precurved poles and only the end cones are single skin. It weighs 1205 grams with all its big fat titanium V pegs and stuff sack and is far far more stable than an Akto. Talking about lightweight / heavyweight / whatever weight on the Challenge is surely immmaterial if the backpacker is two or three stone overweight? Okay the fat backpacker might have a more comfortable crossing if he is carrying a few pounds less on his back, but just think what a good time he would have if he lost those 28 lbs of fat from his belly? I have always maintained that carrying a light load is a good idea in order to have an enjoyable crossing but I can guarantee that if the fat walkers lost all their self-indulgent fat they would have a splendid time! And it would save the National Health Service a fortune in later years. Quite, and similarly, those who are male, 12 stone and 6′ 2″ will have a different carrying ability to 5’6″ 8st female. I read that as the opinion / observation of an sensible and experienced backpacker. I certainly didn’t interpret it as anything else. Quite, and similarly, those who are male, 12 stone and 6â€² 2â€³ will have a different carrying ability to 5â€²6â€³ 8st female. Wot! Wimmin on the Challenge??? When did that nonsense start then???? Blimey… A good pal has drawn my attention to this thread and I’m gobsmacked at how much of a reaction there’s been to those few words of Roger’s in the final notes. What a sensitive bunch we Challengers appear to be! In that single sentence Roger gets in the effects of global warming, the character and fortitude of backpackers and the essential need for good gear. Good gear, I took that as meaning, can include good lightweight gear. Unbelievably there seem to be allegations here of prejudice towards lightweighters, and ignorance about modern gear. What on earth? The TGO Challenge is the most all-encompassing event you’ll find on earth. It draws folk from every background, of any religion, of any gear persuasion. Did any one feel as though they were treated like as second-rate backpacker when they received their certificate in Montrose? Thought not. Any consideration given to which magazine sponsors and promotes the event? Is it not the same one that’s driven the lightweight movement in this country or years? Do you know who was launch editor of TGO (clue: he’s a very experienced, much respected backpacker)? And that in the very first issue of TGO there was a feature by Robin Adshead entitled “The Lure of Lightweight Camping”? Or am I mistaken, and perhaps lightweight UK only took off once the blogging world came into being! We’ve a 1300-word response to Roger’s nine-word “This was not a Challenge for the ultra-lightweight brigade” and another 6000 words of comments. Quite an amazing reaction. I wonder whether anyone’s given any thought to whether this is all over the top? I’m touched that Andy’s made mention of my two lightweight shelters – if he’d asked how I got on with them I could have given him a sneak preview of my TGO gear write-up that’s destined for the October issue of the mag! Enough ranting from me… back to it guys and gals! Each time I have completed the Challenge I have posted up my observations on gear. This thread has a life of its own now but my intention wasn’t to enter into another argument about lightweight â€” this was a post designed for those who already see to point of it all. These arguments will go on forever but it is why I’m thinking about starting something just for those of us who are into all of this who want to be able to share ideas and thoughts without all of the chatter from the skeptics. This wasn’t something aimed at magazines or even the Challenge, although I still have no idea why Roger put that stuff in. Lightweight UK may have only taken off with blogging but that is probably precisely because the mainstream magazines have been so poor. Actually, I think TGO’s focus on lightweight was the real catalyst and we just chatted about it. The chat bit is something that bloggers do better than magazines simply because magazines have not yet understood the importance of moderation, of keeping ‘pot boiling’ or so to speak. But magazines may have another problem in that they appear to be too professional at times. I appreciate that aspirational articles can be important â€” I may not ever go walking in the Highlands but I like to think I might one day. But there’s probably not enough day-to-day content for many people, and that’s where the blogs come in. John, I know you have views about this but I’m not going to ‘out’ you here !!! I will be fascinated to see if somebody manages to capture the middle ground between current mag policy and the blogs. I see GROUCH as a possibility although I really don’t like things that are completely anonymous â€” I have no idea who they are and who they speak for. I suppose views on this lightweight thing will run and run. The point I was trying to make in this thread is that I can see quite a lot of change since I first walked the Challenge four years ago. People have been looking to lower pack weight, they have been reading TGO’s stuff and they seem to think they are benefiting from it. The move to open up the lightweight debate is one of TGO’s better editorial moves â€” mind you I’m sure we bloggers gave them the confidence to do it! Time to sit back and wait for another 90 odd comments !!! I’m sure that the late Robin Adshead was very much encouraged by bloggers’ feedback to his 1978 TGO article! (Roger was editor of the mag back then, for those who weren’t aware). My rant (and it was a rant, I confess!) was more provoked by use in the subsequent columns and use of words such as “prejudice” and “ignorance”, which in my view was unfortunate and unjustified, an over-sensitive reaction; if Roger was indeed intending to be provocative, then he’s certainly succeeded, just as he succeeds every year in organising an exemplary backpacking event. I love the idea of a lightweighters’ forum/community Andy, and hope it will be open to all so that many more backpackers and aspiring backpackers can benefit from the experience of those like Colin, who are at the cutting edge of the practice here in the UK. Now, I must go – Sierra’s lightweight nappy has suddenly, noisily, become a rather heavyweight one. I take your point â€” that was not in the original post rather in the subsequent discussion. There is a balance to be struck here. Nobody is suggesting that Roger doesn’t do anything but a superb job â€” I’m the first to take my hat off to him. But there is this niggling suspicion from a lot of people that a lot of the new blood are there to be shot at! I still think my form of words would have been more welcome. In my experience by far the most aggressive comments in these kind of debates comes from those who have no idea what we are talking about. I’ve seen a lot of lightweight hikers suggest benefits for lighter kit but I’ve never seen any of them tell people they’re talking crap â€” which is what effectively happens. Personally, I’m more interested to discussing things with people (like you) who understand what we’re talking about. That’s why this discussion has been on a blog rather than a general discussion forum I reckon! This makes 74 comments so far â€” I think I need to lie down in a darkened room! It was me who mentioned ignorance and prejudice. Here’s what I actually said, though. After the Challenge I heard that it had been suggested that those with bad blisters had been the people wearing trail shoes. It seemed to me that the comment (i.e. the one about the trail shoes) was based on ignorance and prejudice. And yes, I do think that those who only wear heavy leather boots but insist on having a pop at the people open-minded enough to try something lighter speak out of ignorance and prejudice. NB: I didn’t suggest for a moment that it was Roger who’d said that. It wasn’t, btw. It’s a great pity if it’s not possible for people to take issue with a comment Roger made in the Final Report without it being suggested that we don’t respect him, or acknowledge his enormous expertise. I, for one (and I know there are very many more), have enormous respect and affection for Roger, and I don’t see having a different POV in relation to something as being in any way inconsistent with that. I thought your post “my heart sank at the very idea of anybody attempting to get Roger to retract the comment. Least said, soonest mended…” was a great injection of sense into the debate! I wasn’t intending to single out any particular post, just the general drift that I perceived (perhaps incorrectly? Not sure!) towards a “them and us” debate about lighters and heaviers. Some certainly seem to have taken the comment in the final report personally, which I think is a shame and an over-reaction – there’s no kit check on the Challenge, and nowhere does it state that you won’t be allowed to take part if you insist on sleeping under a hanky, wearing a Gore-Tex thong and having shoelaces tattooed up your shins to save weight on the real thing. Nor does it say that each foot must be clad in a heifer, that four-layer tents are mandatory and that packs under 40kg will be handicapped with lead weights! I don’t regard myself as sitting at either end of the heavier/lighter scale – I have the kit I’m comfortable with and if that means that I have to carry one or two heavier items, that’s the price I pay. I’ve no problem with folk taking issue with the final comments but, the way I see it, too much has been read into that particular comment â€“ I don’t know whether Roger’s aware of this debate but if so he’s probably gobsmacked, and hopefully chuckling into his Glenfiddich â€“ and it might be time to step back, have a day in the hills, and come back to look at it with a fresh perspective later on. I haven’t time to do that this weekend so I’ll have a beer instead! It seems to me that one of the most interesting things to have emerged from this discussion is the question of whether a distinction should be drawn between the relative safety of ‘lightweight’ and ‘ultra-lightweight’ kit. Two things I want to say: first, I find it interesting that all the comments have focused on the perceived slander of ultralighters safety standards, whereas what I find rather objectionable is Roger’s nod towards fashionable consensus where he says ‘May in Scotland is now very unpredictable’. Anyone with an experience of Scotland (or anyone who bothers to check historical records) will know that snow and gales in May up in the Highlands are absolutely bog-standard. It has always been like that and it is irresponsible to suggest otherwise. In fact, despite all the doom mongering, we haven’t had a serious winter storm up here for a couple of years, we had no serious spring tide this year and most of the ‘predictions’ have so far come to nought. So, to suggest that ‘now’ May in Scotland is unpredictable is just utter tosh. But I think that in general Roger has a point, although he expressed it poorly. What he should have said is: guys, if you want to go ultralight, fine, but never compromise safety. Be prepared to change your route if necessary, pitch down at glen level if in doubt and do not skimp on extra layers. It is perfectly possible to be safe and light. No question about that. It is also perfectly possible to go too far in cutting down on kit and end up in trouble. Personally, this year I managed to break the magic 10lbs baseweight and I’m now officially ultralight (although I still stick with boots, given that I don’t like the idea of trail shoes coming apart on a rocky ridge, and I’ve read far too many reports of folks having their Inov shoes breaking off in the middle of nowhere). The only times I’ve been in trouble, interestingly enough, have been in winter when my kit was *too* heavy! Indeed, it’s clear that you can go wrong both ways. What matters, and what Roger should have said, is: whichever kit you have, be safe! And safety has nought to do with kit weight, but with being on the hills in a way that is appropriate for your kit (and vice-versa). I’d have been happy with either Andy’s word formulation or mine. Mountain walking is all about judgement and compromise. Tarp users may well have to compromise a little although people like Colin don’t. Know your kit and use it wisely is. something all of us can agree with I guess. I also thought the weather comments a little odd. Our start was bad so we took another route, otherwise it was very wet. But wet weather can come as no surprise to anyone walking in Scotland. I don’t really understand these Inov-8 complaints though I’ve hears them as well. Mine have stood up to Scotland, Snowdonia, Irish bogs and the high Pyrenees – Terrocs. In geneneral they are not as robust but I get a year’s wear out of mine ( and I know Colin gets something similar out of his). Other brands may be more robust. A heretical voice from the wilderness writes…The Challenge is primarily a social event so there is no surprise when percieved disapproval from big daddy in control causes surprised outrage from the ‘ultras’ a group of lightweight upstarts. Hmm, not sure I want to get into this one. The Challenge can be a social event but it doesn’t have to be. Must admit that my best walking in Scotland (on or off the Challenge) has been done on my own. “The Challenge is primarily a social event”. I never knew! Maybe for some it is. I usually meet very few people. One year I met no one until within a hundred yards of the Park Hotel. This year I met two people at Culra, then spent an evening in Dalwhinnie with the same two and another Challenger. Other than that I saw no other Challengers and hardly any other walkers. As to weather in May, the coldest, snowiest Challenge I’ve done was in 1984 when an ice axe was needed high up and crampons would have been useful. The snow was a foot deep on the Cairngorm plateau. You can walk across Scotland any time you want. If you want to join in a social event, though, the way to do it is via the TGO Challenge. otherwise, it seems that you are taking just up somebody’s place. Why are you doing the Challenge? For the badge? Just my 2 pence worth…. When I finished the DofE, I started tinkering with my kit and started doing things like wearing clothes in bed and taking a 2 season bag into the autumn and winter. I ditched the boots back in ’86 and started wearing non waterproof fabric low mids (essentially trainers with a soft low ankle cuff 🙂 ) . I also discovered that the tent I was using (2kg) could be pitched without the inner and save even more weight. Back in the 80’s I was a teenager with a yearning for the hills and not a huge amount of money so had to improvise but I did manage to get my rucksack weight down quite a bit. I even had a frameless rucksack which was great until the stiching gave way on the shoulder straps! These days, the choice for ligtweight kit is endless and I have progressed a bit further and i still love experimenting with my kits and the weights. sorry for the late post. have been perusing reviews on Akto and Terra Nova tents and was fascinated by the above! I was using a tarp in the marines in the early 80’s! weight was a massive issue and ever since my fitness has gone down and the kit has by necessity followed! I’ve been lucky enough to get paid to “camp” in every continent and every conceivable climate, poles, one or two “big” peaks and have been cold and wet carrrying over 100lbs and cold and wet carrying 10lbs. who gives a monkey’s what you wear or carry? it’s your choice, do it and stuff what anyone else thinks. if you break your back filling a crusader with the kitchen sink or lose your toes crossing ice at minus brass monkeys in your summer trail shoes it’s down to you. just write a review so i know wether or not to use the stuff will you!